We’ve just completed a three-week series on Chemistry, starting with States of Matter, then Mixtures and Solutions, and then Reactions. 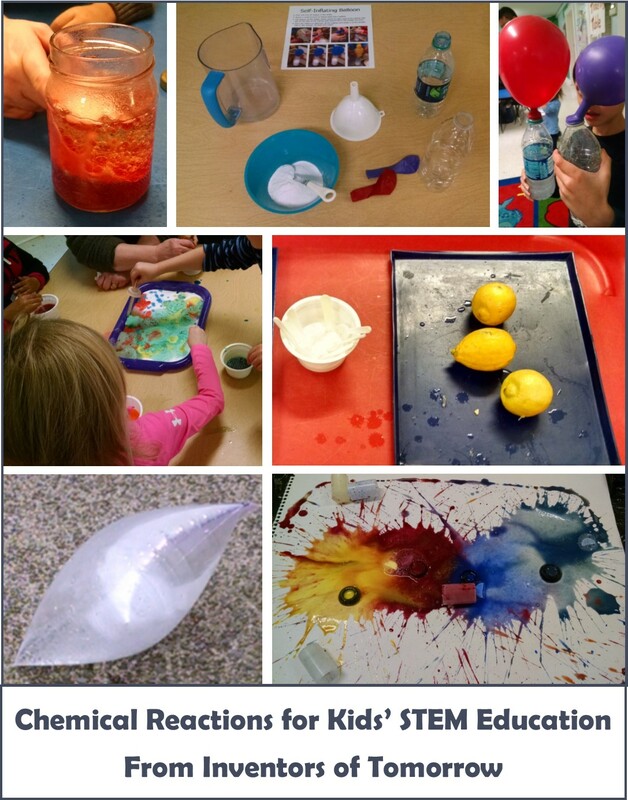 Here’s how we described the big picture of chemical reactions to the kids in class (age 3 – 7): When some chemicals mix together, they “react” and the substances change in some way. Some of the signs of a chemical reaction are changes in color, texture, shape, or smell, or the mixture becomes warm or cold, or it makes sound, light, or bubbles. Jar of Bubbling Goo (Vinegar, Baking Soda, and Oil): This is really cheap and simple, yet really dramatic – check out the video on YouTube! Some of our students loved this so much they wanted to do it over and over. Prep baking soda ice cubes: Use water, baking soda and blue food coloring to make a thin paste. Freeze in ice cube trays. At class: Take a jar. Pour in one inch of white vinegar, two inches of vegetable oil, and a few drops of yellow or red food coloring. 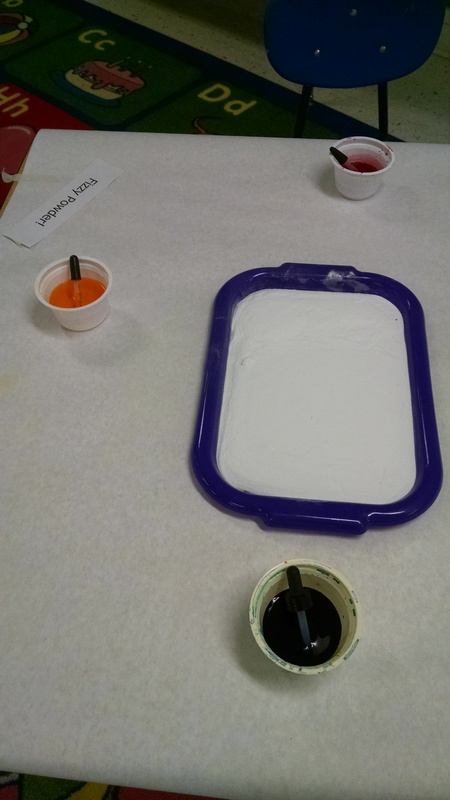 Point out that the oil and vinegar don’t mix, and that the food coloring doesn’t affect the oil – this is a flashback to last week’s class and immiscible liquids. Then drop in a baking soda ice cube. Sit back and observe. 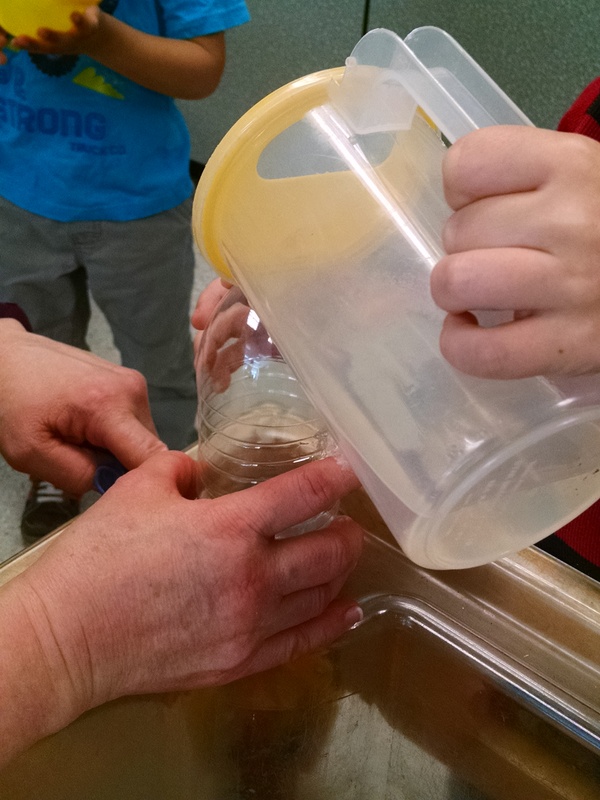 As the baking soda and vinegar react, they release lots of bubbles that rise up through the oil, pop and sink back down. It looks sort of like molten lava bubbling. When the reaction stops, add more vinegar and another ice cube, or start a new jar. Note, since the photo shows a lid…. you can set a lid on top of the jar but don’t screw it down – you want the gas to be able to escape, not build up pressure. 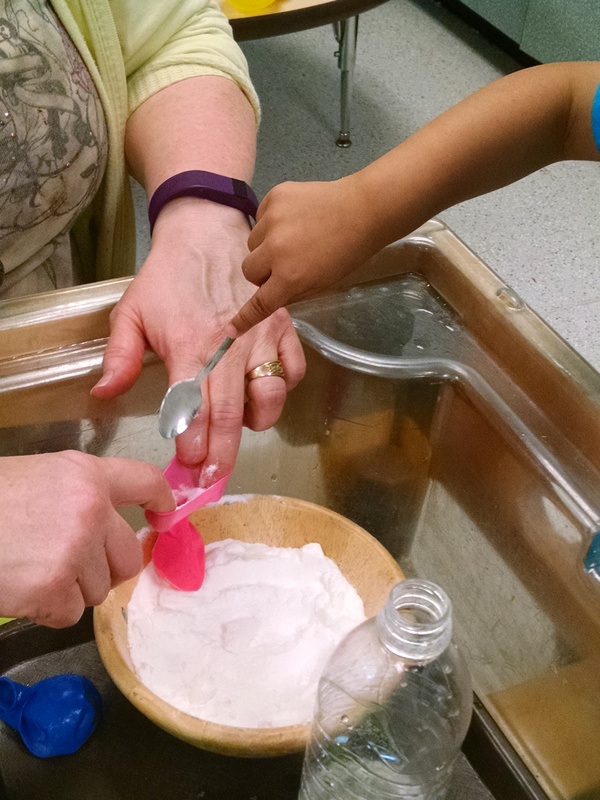 Fizzing Powder: Fill a shallow tray with baking soda. 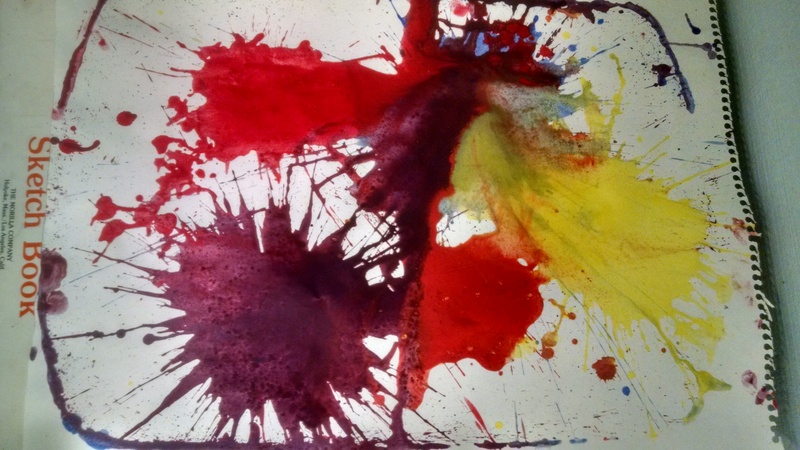 Then mix liquid watercolors with vinegar. Let the children use pipettes, eye droppers, turkey baster, or spray bottles to drip colored vinegar on the baking soda and watch it fizz. 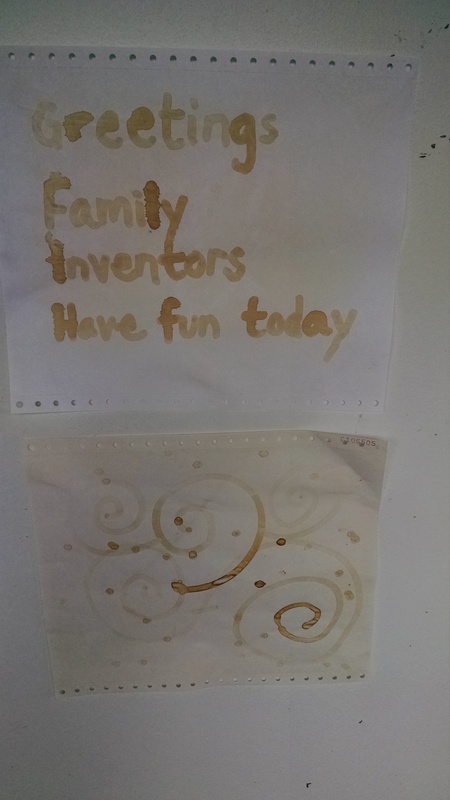 (Note: we tried taking coffee filter prints of the product, but it wasn’t a very interesting art project, so we decided to just leave it as the basic tray of fizzy powder activity.) See more pictures of this at Hands on as we grow and Creatively Blooming. 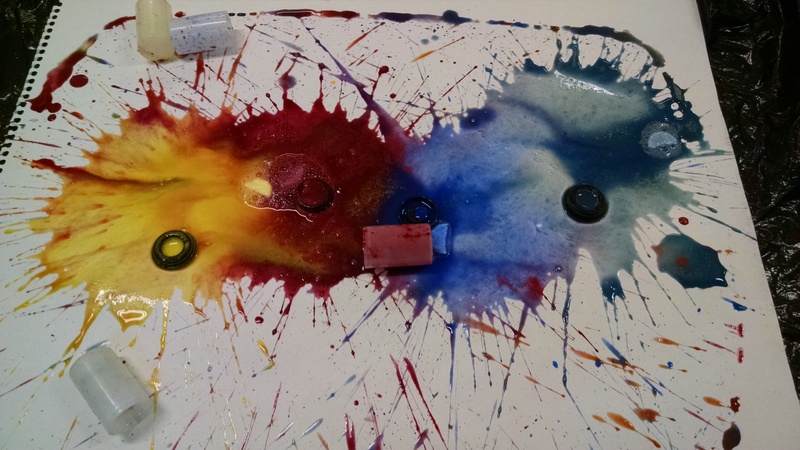 This is simple, cheap, easy to clean up, a great exposure to chemical reactions, a fun art process activity, and great small motor practice. 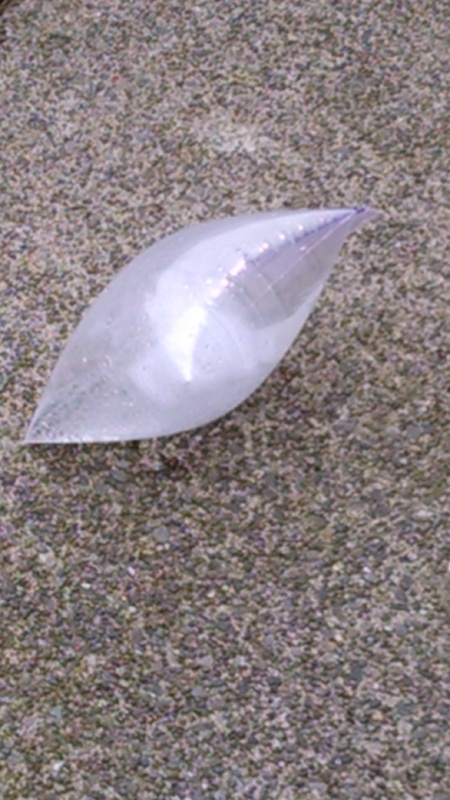 Self-Inflating Balloon – Blow up a balloon with a chemical reaction. Pour one inch of vinegar into an empty water or soda bottle. Put the balloon on the top of the bottle, being careful to have most of the balloon dangling off the side so the baking soda doesn’t fall into the vinegar too early. Once balloon is attached, hold it up. Shake it so the baking soda falls into the vinegar. 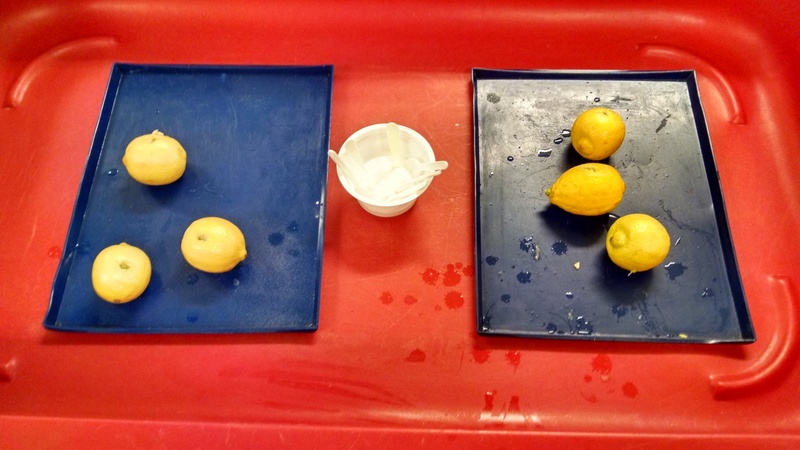 There’s a great description of the science of this experiment on the Science Club website: http://www.webinnate.co.uk/science/week2.htm. 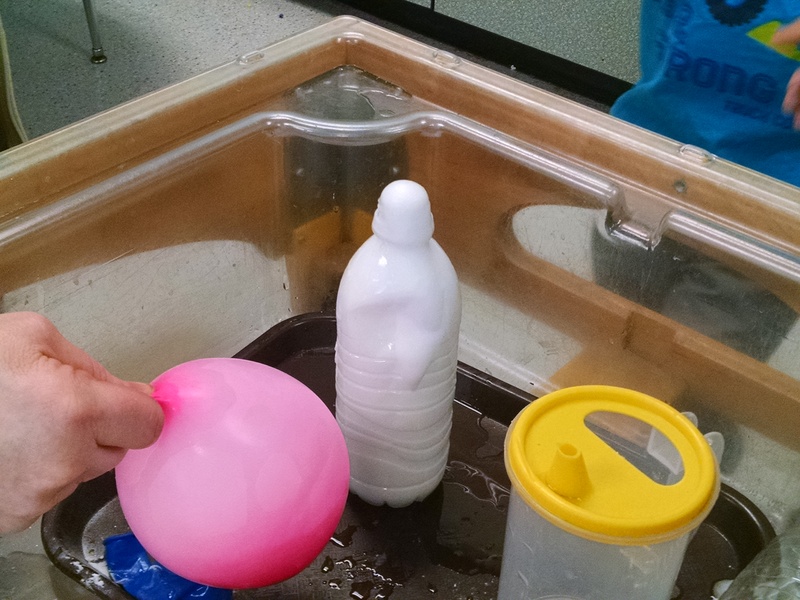 Extension: you could see what happens if you “turn this around”: put baking soda in the balloon, use a pipette to squirt vinegar into the balloon, then hold the balloon closed. Erupting Lemons: Partially core a lemon. Sprinkle some baking soda into it. It will produce a fizzy mini-eruption. If you want more reaction, squeeze the lemon to release more juice, or add more baking soda. 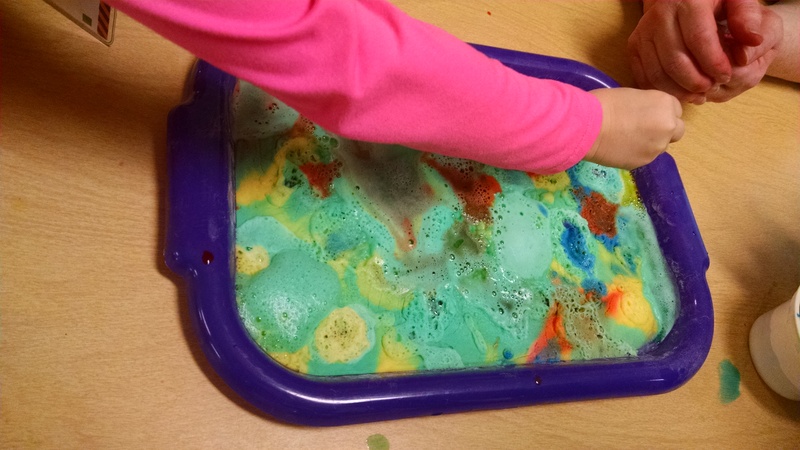 We explained that today we would study chemical reactions, and that when we mixed some things together, they would fizz, and when we mixed others, they would change color, and others would go boom! Song: We sang Boom Chicka Boom. (watch the video here) It’s an easy, and fun, call and response song. Glow Bracelets / Glow Sticks. [hold up illustration] Explain that inside the bracelet, there’s a chemical mixed with fluorescent dye, and there’s a glass tube that contains another chemical called hydrogen peroxide. When you bend the bracelet, you’ll hear the glass break. It releases the hydrogen peroxide, and the chemicals mix, and the bracelet glows. 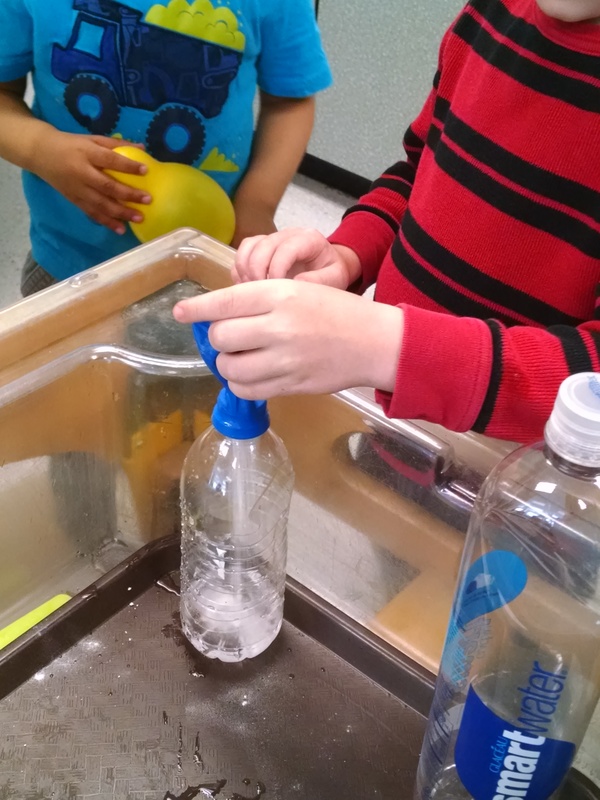 Baking soda and vinegar: Mix in plastic cup. 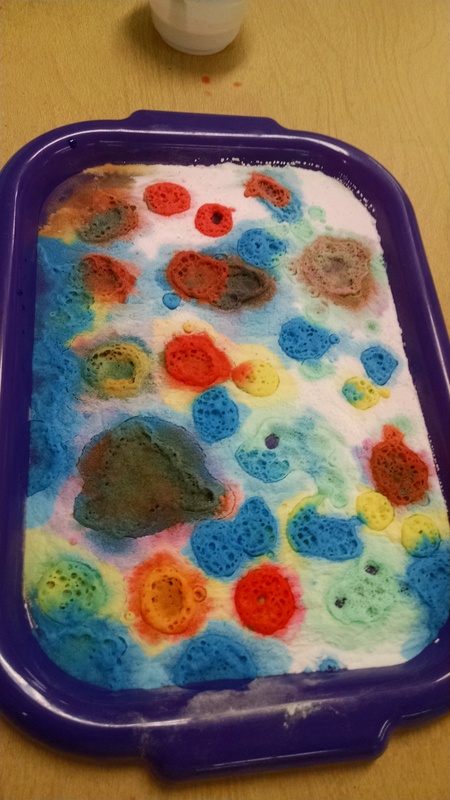 Point out that when they’re mixed, they produce foaming bubbles (carbon dioxide gas) and make a fizzy sound. Alka-seltzer: put a small amount of water and a tablet of alka-seltzer in a zip-lock baggie. 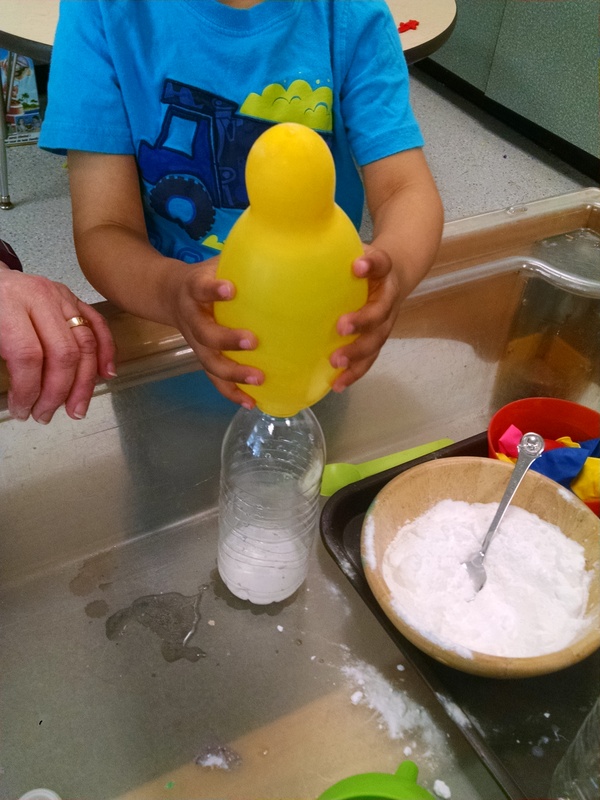 Seal it – ask what they see – bubbles. Walk around, holding it up to kid’s ears – what do they hear? Fizz. Ask them to notice what’s happening to the baggie – it swells. Feel the bag – it’s cold. Endothermic reaction. 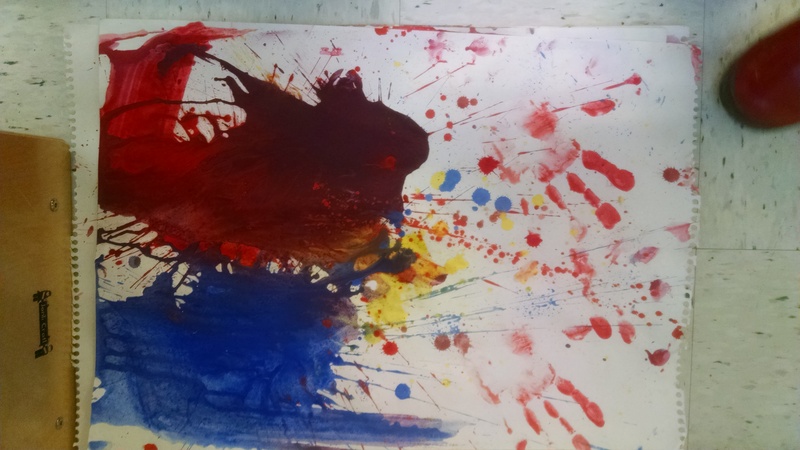 Exploding paint bombs. Fill film canisters with a water-based paint. Add an alka-seltzer tablet, cap it, shake it. Put it lid-down on a piece of paper and step back!! Zip-lock time bombs: www.geeksraisinggeeks.com/quick-science-experiments/ and https://www.exploratorium.edu/science_explorer/bubblebomb.html. Now, working very quickly… put baking soda bundle into the baggie. Zip it closed. Toss it into a plastic tub or something else to contain the mess (if desired). Start counting till it explodes. It will take 20 – 30 seconds, unless you shake it first – the more you shake it, the quicker it goes. The fun thing about the Ziplocs is they build anticipation as the kids see the bag swell, and swell more, and more… until it’s bulging and straining, then it starts rocking, then it blows. Group management: If you’re doing this in a group of preschool or elementary age children, you need to plan ahead for an effective assembly line. First, have all the kids come up and make a baking soda packet, till you have enough lined up ready to go. Then give each child a Zip-lock. Then add water, then vinegar, then zip closed till you’re ready for them. Then have kids come up 3 or 4 at a time. They hand you the zip-lock of liquid, you open it, put packet in, zip it and toss, and remind them to move back. Fizz. We made something that websites in Australia and New Zealand call Sherbet but that isn’t what I think of when I think of sherbet. It’s a fizzy powder not an ice cream substitute. With the kids, I called it fizzy candy powder and compared it to Pop Rocks and Zotz candy. The recipes I found called for citric acid crystals, sugar, baking soda, and drink crystals (koolaid?) to give it a little flavor. 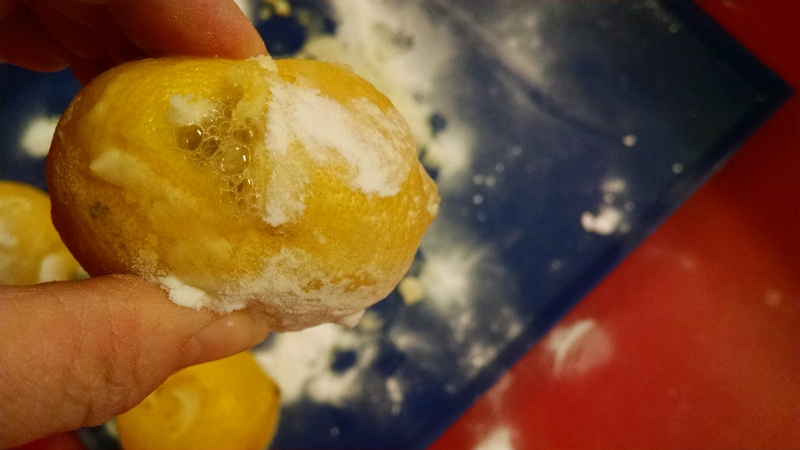 I reminded the kids of today’s experiment where we cut open lemons and sprinkled baking soda on them – as soon as the baking soda hit the juice it fizzed. 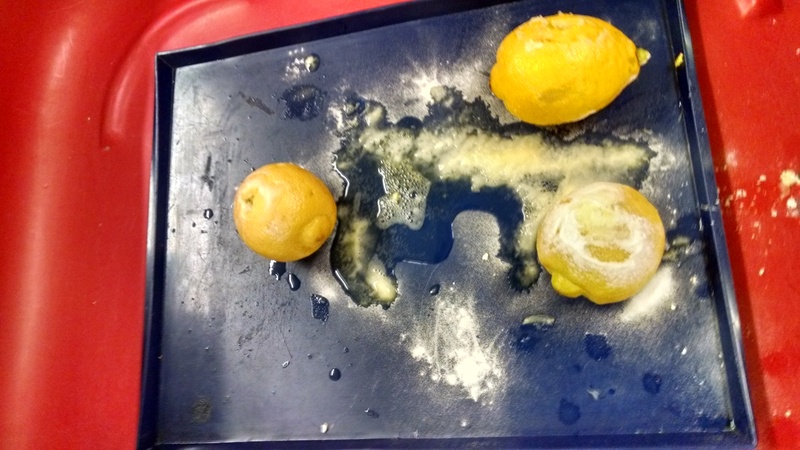 I told them the true lemon was lemon juice that was all dried out, and that it needs water to react. So then we sprinkled a little into a cup of water – it fizzed. Then I had kids open their mouths, I sprinkled just a little on their tongues and they closed their mouths and let it fizz. In the morning class, 80% of the kids tried it and the 5 – 6 year old boys wanted to try it again and again. In the afternoon class, I first offered it to some hesitant kids and they refused, so only about 25% of the kids tried it, and one of the young ones was a little distressed by the experience – we had to encourage him to rinse the taste quickly by drinking water and eating more snack. 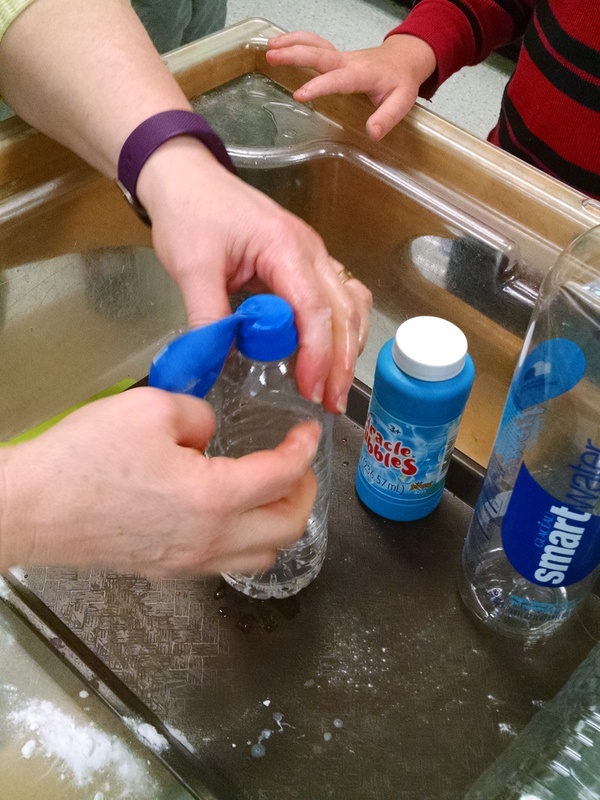 Put an empty soda or water bottle on a tray (we used a 1 liter Dasani water bottle). Add 1/4 to 1/2 cup hydrogen peroxide. Note: many websites say it has to be the strong type you can get from beauty supplies (it’s called “clear developer“. You’re looking for volume 20 which is 6% hydrogen peroxide), not the weaker 3% concentration you find in the grocery store. But we’ve tried both, and they’ve both worked fine. Put water and alka-seltzer into film canisters. Put lids on quickly! Flip them upside down, set them down, and step back quickly! In 15 – 30 seconds, they will launch 15 – 20 feet in the air. So much fun! Read my film canister rocket tutorial. Mentos and Diet Coke: We ended with this outdoors-only demo. Many of our older kids (5 – 7 year olds) have seen YouTube videos of this. Either very simple demos, or amazingly intricate Mentos fountains. We had 20 ounce bottles of diet coke. 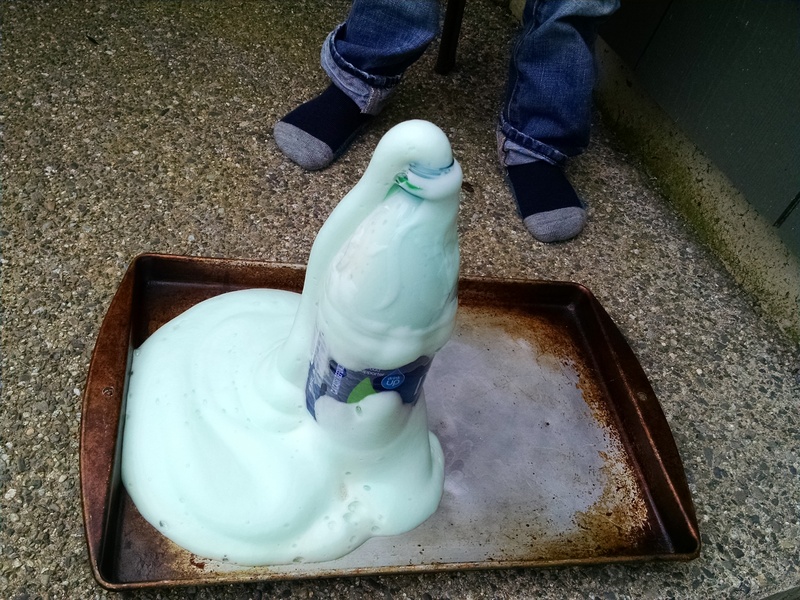 I opened one, tried to drop in three Mentos – as soon as the first two hit, it exploded, so number three got blown right out – geyser went up maybe 6 – 12 inches? Fun and messy, but no great thrill, really. Then I used this Geyser Tube , loaded with 6 Mentos. When we pulled the launcher, the geyser only lasted for a few seconds, but it shot many feet up in the air, which the kids loved! Book: In all my searching, I’ve failed to find good books for age 3 – 6 about chemistry. For last week’s mixtures class, I wrote my own book. This week, we just didn’t do a non-fiction reading. For fictional books, there’s a couple options. The Secret Science Project That Almost Ate the School by Sierra and Gammell. 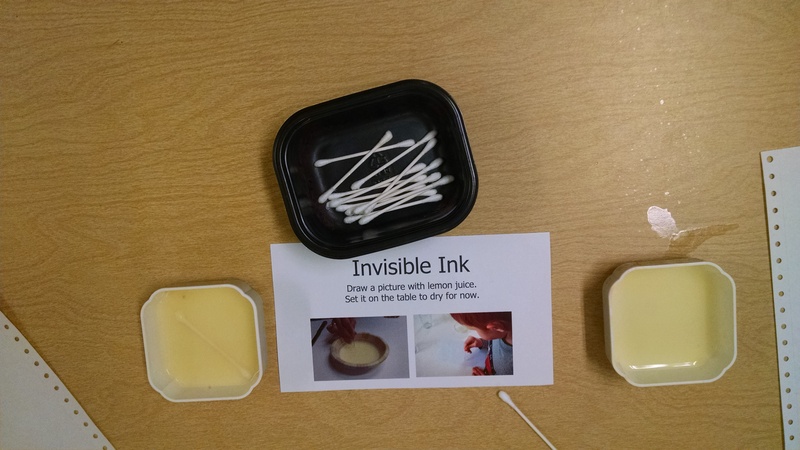 A silly story about kids preparing for a science fair. Our protagonist has no ideas for projects. She orders a super slime from the internet that eats her cat, her sister, her teacher… and is finally vanquished when the children feed it too many sweets. Because young children thrive on routine, we try to have the same structure to our class every week, where they explore all our activities hands-on for 20-30 minutes, then we do an opening circle where we explain the science behind what they’ve been experiencing, then they do them all hands-on for another 30-40 minutes then outdoor time and closing circle. But this week, we had several activities that a) would require very close supervision, b) could only be done once or twice so we wanted everyone to see it, and c) could make a really big mess. So, we needed to do things differently, with 20 minutes of hands-on projects, 15 minute circle which included activities, 15 minute snack time which included demos, 15 minutes outside hike, 15 minutes outside activities, then a book to end with. Our morning class handled the new routine fine. The afternoon class didn’t. They lost focus during opening circle, and wandered to snack early, then during snack couldn’t focus on the demos we were doing, so we dropped some. Next year, we’ll think more about how to manage the routine and short attention spans. So much of this class is about messy demos. If you do all the prep in front of kids, they get bored. If you try to prep while kids are in the classroom doing activities, it’s easy to get distracted and miss things. I’ve learned the key to success is to set everything up before class. Each section of class has its own designated plastic tub, out of the kids’ sight. Each tub had its own measuring spoons and cups and everything so NOTHING needed to be moved between tubs. I did things like open and break up all the alka-seltzers in advance so I didn’t have to do it while kids waited. 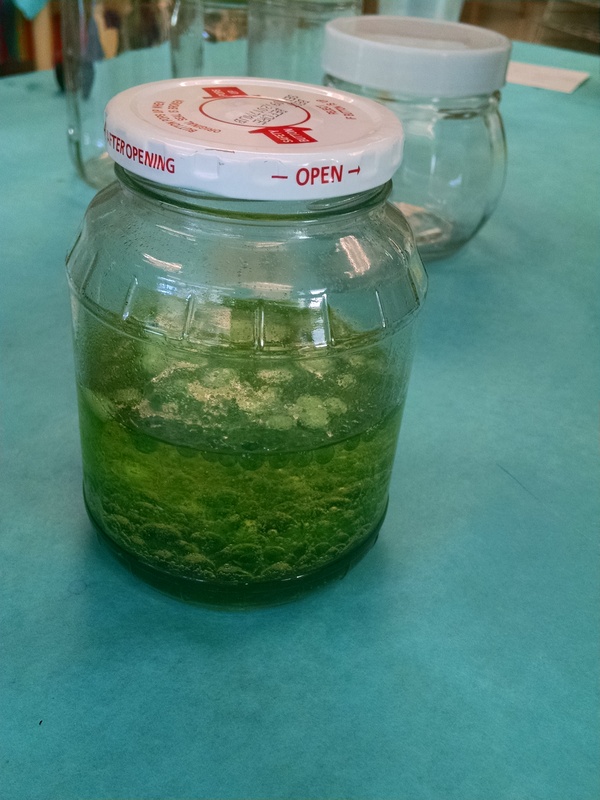 I had a classroom volunteer who I’d told ahead of time that when I finished each experiment, I would hand him a tub and he’d carry it away and handle all the clean-up while I went on to the next one. Here’s my list of tubs and their ingredients. Note: you’ll need LOTS of ingredients for this class! If you’re just doing one batch of each at home with your kid, you’re probably fine with what’s in your cabinet. 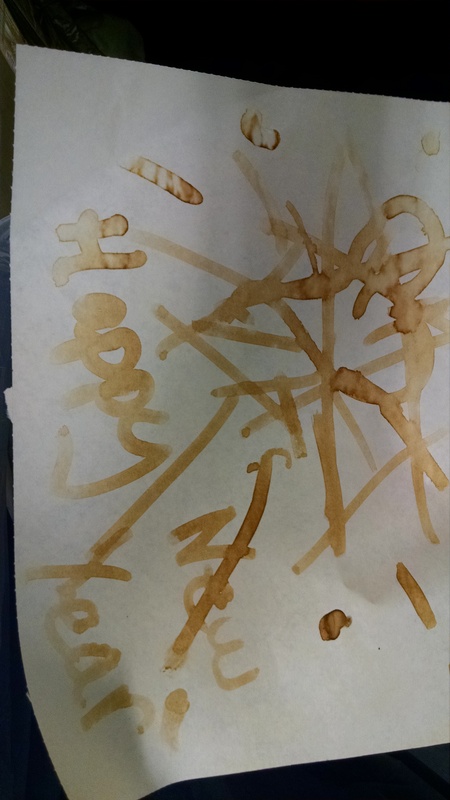 But, we had 9 kids in our morning class, and 10 in our afternoon, and we used: 1 gallon of vinegar, 24 ounces of oil, and about 5 pounds of baking soda, plus other ingredients. Pop a cork: You could use a test tube with a stopper or a glass bottle with a tight-fitting cork. Fill with either citric acid, baking soda, water or vinegar/baking soda. Test to see what quantity you need to pop the cork. http://childcentralstation.com/2011/08/perfecting-blowing-the-cork.html. Last year, we made Milk from Plastic. Try this at home! Have fun with all your fizzy explosions!